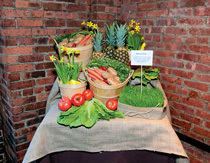 McDonald's NY Tri-State Area Owners/Operators Association and MWW Group, its longstanding AOR, launched a campaign on March 27 to drive nutrition education in New York, Connecticut, and New Jersey communities. "McDonald's is committed to nutrition and has offered healthy menu items for many years. However, we felt we needed to go beyond our menu," explains McDonald's franchise owner and operator Nellie Thomas. "We want to change the conversation about McDonald's and nutrition and educate consumers about making good nutritional choices, not just at McDonald's, but wherever they are. We feel that's our responsibility as a leader among quick service restaurants," adds Thomas. Five grants of $5,000 were awarded to Tri-State community organizations to support nutrition education programs that must be completed by December 31. "We partnered with registered dietitians to deliver nutrition education and messaging at public events," explains Alissa Blate, EVP, global practice director, consumer lifestyle market- ing at MWW Group. "We also helped public officials understand the program and asked them to encourage their constituents to apply for the grants and partnered with nonprofit organizations to help us select grant winners." Local media, blogger relations, and social media engagement also drove awareness. Registered dietitians Tanya Zuckerbrot and Sharon Richter both delivered general nutrition messaging and messaging specific to McDonald's and nutrition at various events. Zuckerbrot hosted a March 27 launch event for media and mom bloggers at the McDonald's located at 220 West 42nd Street. Local and regional media and mom bloggers were pitched throughout the campaign. Richter spoke at the YMCA Hackensack Healthy Kids Day, the Long Island Marathon Expo, and the Staten Island Health and Wellness Expo. Tips from events were tweeted on the Twitter handle @McDNYTriState. The agency identified and encouraged more than 2,000 community groups to apply for the grants by June 15 on www.McDonaldsNYTriState.com. Nonprofit organization representatives and nutrition experts judged grant applications based on numerous criteria, including program reach and efficacy. The team also supported various agencies that represent McDonald's in multicultural markets throughout the Tri-State Area in hosting meet-ups and promoting the campaign. Winners were announced on August 22 and presentations were made afterward. An internal microsite that includes campaign and nutrition information launched on September 17 to engage employees of McDonald's. More than 200 grant applications were submitted - nearly 500% above goal - by organizations across the Tri-State Area. As of late September Twitter impressions hit 5.4 million, with a Sysomos sentiment score of 98% favorable. More than 125 traditional media and blog placements were garnered in outlets including The Bergen Record, Newsday, and Stylemom. Overall traffic to www.McDonaldsNYTriState.com increased 30% between April and June 2012 compared to the same months in 2011. "As an owner, I'm very pleased with results," Thomas adds. "Conversations I hear in stores and at events have shifted." Planning for phase two of the campaign, expected to launch in early 2013, is under way. It's great to see this team drive the company's overall commitment to nutrition deep into local communities. Partnering with respected dietitians was smart and undoubtedly helped traction, especially among mom bloggers. It's evident the association is truly committed to nutrition education rather than simply promoting McDonald's - and that authenticity is critical to the goal of changing the conversation about McDonald's and nutrition. Results were outstanding, and this team seems committed to the effort required to keep reinforcing messages.